There are plenty of Android app prototyping tools available for download. It might sound weird in the beginning but if you are planning to quickly create prototypes for your next mobile application then Microsoft Office and PowerPoint can help to get this job done. PowerPoint is so widely adopted that the chances there exists an installed version of Microsoft Office in any of the developer’s office computers is high. Even if it is not available in the office there are other packages that have a good compatibility with Office documents like LibreOffice or Keynote in Mac. Using PowerPoint and shapes, you can easily model a user interface and make a mockup, although there are plenty of templates available that provides a stylish UI design for modern user interfaces. 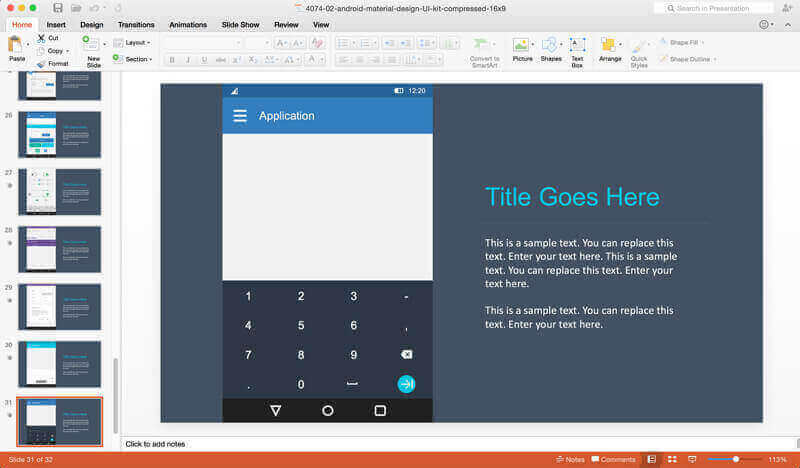 The Material Android Design Kit PowerPoint Template provided by SlideModel offers a full set of design elements that you can use to make your Android app prototyping very easy in Microsoft PowerPoint, Apple Keynote or even in OpenOffice. 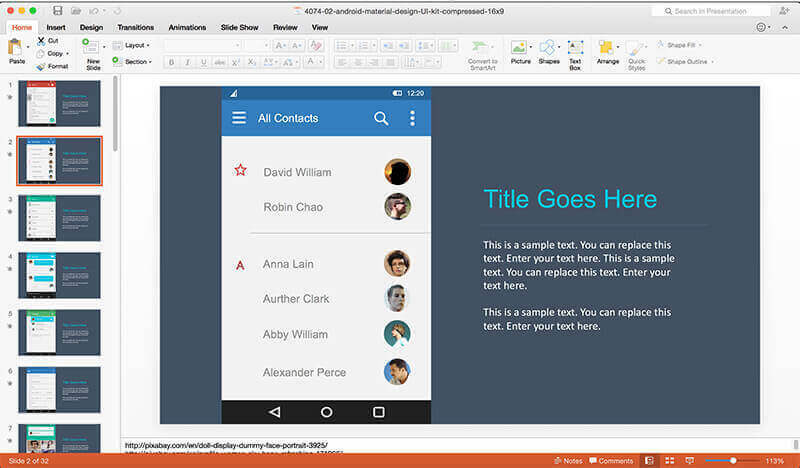 Each slide in the Android Material template contains an Android screen with Material layout and atomic controls. In total there are 31 slides available and the elements provided as widgets are 100% editable in PowerPoint, you can rearrange, move, change the shape properties to match any desired layout beyond a mobile application or re-size the elements without affecting the image quality. This can be very useful if you want to make a desktop or tablet app design based on the Material UI. The colors in this presentation are controlled via Theme Colors feature in PowerPoint so you can easily replace colors globally and there is no need to go the widget by widget. This Android design UI template is great for agile development teams to quickly produce prototypes based on the Google’s Material UI design. However, it can also be a powerful tool for Project Managers who want to validate a mobile app design earlier in the design process flow. SlideModel requires a subscription in order to download any content from their site. If you are PowerPoint user you may find this service quite useful for finding good presentation designs not only for software developers but also for business presentation needs, marketing, finance and more.